Charles Harris delivering a Masterclass Seminar. At the beginning of his artistic career, Charles was encouraged to work as a teacher/lecturer for a chief educationalist in his area, reporting back on his findings. At the time, Charles was appalled to discover in many places within Education – the methods of coloured sticky paper and the ideas of conceptual self-expression – rather than the necessity of teaching practical formal academic art training. Charles said, “Sadly, in education, the curriculum for Art gradually changed. Before the apparent introduction of a modern preference for writing about art in exams, especially modern art, the main necessity for art had been in the actual practice of painting and drawing.” – extract from ‘Trust Your Eye’ by Charles Harris. By contrast, Charles’ approach in teaching, is practical, traditional, unconventional in the face of today’s Modernism in Art, unique and totally effective at every level. Charles’ clear views and strong straightforward practical ideas on design, perspective, form and space and the accepted values of tradition in Art influenced many people. This occurred particularly following the influence of Peter Greenham OBE, Keeper of the Royal Academy, who insisted Charles should teach and encourage the passing on of basic traditional values in Art. From early Surrey days with his friend ‘Woody’, a top BBC computer programmer who went on to work for NASA – to one of Charles’ earliest students and life-long friend David Klein, a qualified engineer who later became a leading portrait sculptor and who was selected as a Victoria & Albert Museum Sculpture Finalist in 2006. Many years ago Charles took the basic principles of his first three years of study at the Royal Academy and condensed them into a short series of overlapping classes. Gradually through teaching practice, these ideas were refined into today’s basic four-part Masterclass programme, which both provides and requires the best from students at all levels. There follows various examples of classes Charles has held over a number of years, showing detailed drawing, large perspective exercises, demonstrations and seminars. Charles also did numerous demonstrations all over the world and often by special request, including for example, demonstrating at the Edinburgh Fringe Festival. One of Charles’ Advanced Masterclass pupils at work. Happily, Charles’ programme can be applied across the board, from the basic Beginner, to an Advanced practitioner. It requires both thought and practice, and has led to stunning results for all concerned over a number of years. In the mess that we see in today’s Modern Art world, we can safely say that Charles employs no trendy art jargon, nor uses conceptual ideas to achieve practical results. Leading Business Coach, Dr. Richard Norris, of Action International, has regularly maintained, “Anybody employing Charles must see his services as the ultimate investment for the future.” (also see Investment section). Martin Herbert, who, with his wife, attended one of Charles’ Masterclass Seminars on Italian Renaissance Painting at the ‘Viva Italia’ Exhibition held in Earls Court London, said – “We were impressed with the presentations held on the main stage, particularly Charles Harris – the art lecturer – who incorporated his passionate views into an extremely informative and entertaining lecture – we have never seen anything like it – more please!” (see Quotes and Reviews section). From the outset, with the high standard of tuition encouraged, several of Charles’ students were accepted for interviews at the Royal Academy in London. Elsewhere his students have been accepted for colleges and universities throughout Britain and Overseas. His students have also won many prizes and awards. In recent times, a fourteen-year-old student won the top Scottish Schools National Painting Prize competition. For those of you considering Charles’ current Masterclass programme, age and expertise or a lack of age and experience, or any other combination whatsoever, will prove no impediment with the tuition he presents. Some notable examples of this occurred early on in his teaching career. He successfully taught complex perspective drawing to both an eight-year-old girl and an eighty-three year-old man together, in one large advanced class. 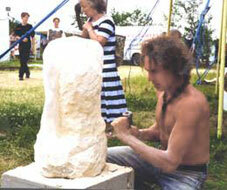 While, another example was the first Artist in Residence scheme pioneered by Charles, at a Surrey school, which was featured on a BBC Television Six O’clock News programme. As a part of this innovative project, Charles also held mixed evening classes that comprised pupils, teachers and parents alike from differing age groups, all at the same time. This project also included a major group painting of schoolchildren, currently held by Surrey County Council. Practically, Charles’ teaching methods, like his views on Modern Art, get to the heart of what Traditional Art and the ‘Great Tradition in Art’ previously represented. His methods and views are therefore simple, direct and universally appealing. For practical experience, before embarking on his recent programme of Masterclasses overseas, Charles celebrated his 500th private class in an eight year period. Immediately upon leaving The Royal Academy, Charles was approached by a leading Education Officer in his area, who had numerous schools, several colleges and a university within his catchment area. He asked Charles to teach and demonstrate. He also asked him to report back on the condition of Art Education within these establishments. Eventually, Charles taught at every standard and level, from reception class, to sixth form in schools, plus talks and lectures at colleges and universities, usually between portrait commissions. Thus began a long period of teaching and lecturing to the present day with Masterclasses and seminars overseas, an activity he started back at the beginning between those portrait commissions and other activities. The highly successful Masterclass programme which Charles recently pioneered, first began in Italy, at the British Institute in Florence, and was then repeated in the USA, and then again in Scotland. When not wearing smart clothes, Charles was often asked if he would provide demonstrations and mini-classes at his overseas shows and exhibitions. A recent example of his live demonstrations occurred at Earls Court London in 2006. Private tuition or individual Masterclasses can be arranged anywhere at any time. In 2006 Charles received a special request to present classes as part of a cultural programme being staged at an exclusive private Villa in northern Italy. For those of you interested in this new Italian adventure, please contact us as soon as possible, for places to Charles’ courses tend to fill rapidly. For the best in Traditional Art tuition – please contact us directly and we will be delighted to assist you with your enquiries. Our plans are to continue to offer improved Art Education in the present and in the future. We plan to offer this both as Approved Academic Courses, or Vocational Courses. Accordingly we have created our own qualification to this end. We consider it to be the equivalent to an art degree and have valid reasons to make this claim. In general, we are seeking to continue to improve Art Education with better methods and understandings, achieving a new and sensible attitude in art education for all of society through the appreciation and teaching, with new classical drawing and painting skills, and appropriate understanding by the teaching of those lost skills, their importance, and lost social values. Practically this is achieved by encouraging a return to an appreciation of beauty, life, nature and human nature, as the primary subject matter for Art. This helps encourage a general public perception of improved education skills and better social values for the 21st.Century, deliberately seeking better standards in life, in the arts, in entertainment and human interaction, as they all interlinked. These ideas have grown over years of experience and began with the first Artist in Residence Scheme held in English Schools and have continued ever since, through 500 plus classes held at an art centre in Scone followed by masterclasses at exhibitions across the globe, and into art schools in Italy and public and state schools here in Scotland. Our students have come from all walks of life and we believe the skills learnt are both transferable and life advantageously improving, through the use of the imagination and practical confidence gained. We are therefore looking to meet Chief Educationalists and others with responsibility for Art Education for their society, through the appreciation and teaching of classical drawing and painting skills, instilling appropriate understanding, and encouraging a return to the appreciation of Beauty, Life, Nature and human Nature as a new suitable primary subject matter for Art today. These are transferable skills, and have provided numerous, otherwise unskilled people, or students without sufficient academic qualifications, a route into knowledge and career opportunities. We offer the highest possible standard of Art Education, both practically and theoretically. Our principal, world-famous classical artist Charles Harris, has staged Exhibitions across the globe with accompanying masterclasses, live demonstrations, seminars and talks. Our emphasis on Education has been continuous. Charles founded a new movement in Fine Art and has staged masterclasses across the globe since his tenure as a prize-winning student at the Royal Academy in London. This has led to the creation of a new programme of art classes, with an art certificate considered to be the equivalent to a formal traditional art qualification, plus accompanying life skills. Charles Harris International have also completed the publication of an authoritative book on classical painting and we are currently engaged in producing a ‘how to do it’ instructional text book, and a further book questioning the validity of contemporary art. Past clients have included schools, colleges and universities in England, Scotland, Italy, Hong Kong, USA, plus countless individual masterclasses, particularly for the underprivileged or socially disadvantaged, who may not otherwise have the opportunity, or equally for young adults returning to formal education. Again, our plans therefore are to continue to offer improved alternatives for Art Education in the present and in the future. At Charles Harris International we have a long record of delivering successful art classes in the last twenty years. Our principal Charles Harris began teaching private candidates at the behest of the Keeper of the Royal Academy, the late Peter Greenham OBE, who then telephoned Charles’ students to enquire how they had got on. We believe Art can offer people without developed writing skills an equal opportunity to explore themselves. The learning or improving of drawing skills will help students or interested people in general a chance to discover more about themselves and the world around them, and these skills will then automatically help them to extend themselves into other areas. This ability to raise the human spirit from the drudgery of everyday life through the pursuit of knowledge and excellence is an aim that Charles has always supported. At that time, in a highly competitive environment, he was awarded the Royal Academy Bronze medal for Drawing in 1978, the Silver Medal for Drawing in 1979, and the Freedom of the City of London, along with the Freedom of the Worshipful Guild of Painter-Stainers in 1980-81. In 1983 Charles was also elected to the Livery in the Guild of the Painter-Stainers, and, whilst still a student at the Royal Academy, Charles was also chosen by Britain’s leading art critic Brian Sewell, as ‘one of the six best painters for the future’, and we believe he has lived up to that promise. A New Future in Art Education Today. For many students or pupils Art Education is a major challenge today. The likely uncluttered simple joy this subject previously offered has become a complex subject. Frequently called Art & Design, there now exist opportunities to study in a wide range of professional design disciplines, now called ‘The Area of Applied Arts,’ such as jewellery, ceramics, textiles, printmaking, graphics, illustration and computer aided design, including animation. Students are offered the opportunity to study in so many different subject disciples, for example, photography, but all incorrectly described as Fine Art. This situation probably arrived as a result of the poor influence of part-time modern artists all claiming to be dissolving the barriers between disciples and bringing these ideas into education. Practically this has been a disaster for genuine art, and has led to the lowering of standards in the actual practices of art, and the professional training required to pass on the necessary skills. In particular a major loss has been in the teaching of basic skills, always built upon the foundation of Drawing. Thus proper drawing skills and painting skills have almost disappeared, gone along with the idea of, ‘Yes we must learn how to draw first, before we can develop and progress in other areas of modern art.’ However in practice, people making these claims mostly could not draw in the first place. Whilst with the dictates of common sense, no practicing professional would make this claim. As you cannot progress away from drawing, you can only continue to improve in a long life time of study, or else abandon the discipline entirely. This was what usually happened, to be replaced with words. Shockingly, we then saw pages of words presented as art and a written ‘Artist Statement’ became a compulsory practice in today’s apparently visual world of modern art. This was entirely opposite to the visual disciplines and alternative opportunities of self-exploration and discovery into the world of knowledge, for those unfortunates without sufficient formal academic opportunities, and also for those seeking to pursue different traditional practical skills and the pursuit of excellence within those proven past disciplines in a traditional conventional visual world of art. “All of my life I have been involved with Classical Painting – which actually shows the visual Love, the understanding of Life, of Nature, and of Human Nature, that has become lost today. Last year I finished writing and published a book, you will find it in the libraries of the National Gallery in London, the Royal Academy, the Tate Gallery, and the Uffizi National Gallery in Florence, Italy. Now I want to do better, and enrich peoples’ lives with improvements to Education. For seven hundred years, wonderful European paintings from the Great Tradition have helped in the development of mankind. It led in the Renaissance. It assisted in the Reformation. And it ended with the Impressionists. So it is my personal view that the greatest loss today for Art has been with the abandonment of those traditional ideals of beauty, life and nature, all portrayed with proven skills and standards, which those past paintings always achieved. Instead of modern mutterings about – “Oh my god, he’s a modern artist and he’s about to have an inner experience.” I should like to hear and see once more those large ideas of beauty and life, all recorded properly and shown again, bringing fresh new hope and vitality to a stale contemporary art world. I believe we all need a new traditional step, leading the way once more for a better future in art and life. 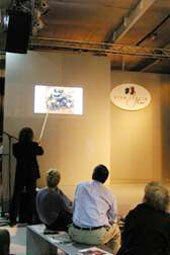 Charles held masterclasses at the British Institute in Florence, Italy – organised by Christine Wilder. He spent every lunch hour at the National Gallery in London whilst a student studying the world’s best classical paintings. Spent considerable time in Florence in research and preparation for his book ‘Trust Your Eye: An Illustrated History of Painting’, and also in Munich, plus the Metropolitan Museum of Art in New York, the Tretyakov State Museum in Moscow and the Hermitage in St. Petersburg. Awarded Academic Cultural Exchange visit to Russia and gave Talk at the Repin Institute. Held a correspondence course for an inmate at Wakefield Prison as part of his rehabilitation programme. 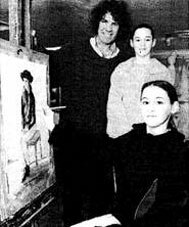 In 1990 Charles made and presented a video on ‘Traditional Painting from the National Gallery’ with Prof. David Morris, former Art Historian at the Royal Academy, to the BBC and Channel 4. In 1995 Charles founded a new movement in Art called ‘New Traditional Art™’. Invited to form and lead the New Human Realists in 2014 – numerous academics from across the globe to encourage a return to traditional painting. 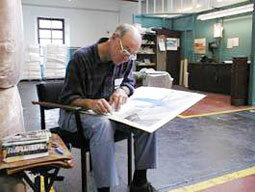 Charles formed the Traditional Art Association with Barry Scott in 2007 to encourage traditional drawing skills. Former masterclass students still email photographs of their work for appraisal by Charles. During the British Institute masterclasses in Italy, famous local private art school sent their top students to theses courses. Charles then extended this famous programme of masterclasses to ten for one complete term. During the Pescara Exhibition in Italy, several Italian students completed an art history course, eg Dajana and Emanuella. Charles created a certificate and both students used this as a qualification to supplement their applications to Italian university – Dajana in art and Emmanuella in architecture. Charles created a new Traditional Art Certificate for Scottish art student Lise who used this certificate along with a portfolio of her work to achieve promotion into the second year of a four year course at university in Scotland. Within two weeks her work was photographed by the university and held as the new standard at the university for entrants. He also ran courses especially for A-level students returning to Education to secure an A-level in Art. Charles also coached students at A-level English for the same purpose and encouraged creative writing for adults. Numerous students over the years have entered schools or universities with the help of a portfolio produced by Charles. He taught a juvenile youth with social difficulties, who was inspired through this experience, and who achieved the Art certificate course. He then joined the army, (the Black Watch regiment), and later won a medal. Charles also taught an art student who used this course as an addition to assist her admission to the RAF. A fourteen-year-old girl, a former student of Charles, won the top Scottish Schools Painting Prize. In Hong Kong Charles was asked to give a lecture to ex-pat Brits on the subject of ‘Traditional Art’. 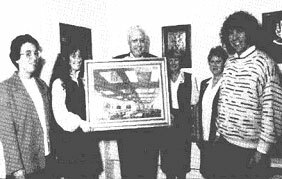 In October 2001 Charles was requested to give an address at the Worshipful Company of Painter-Stainers in the City of London. The subject was ‘The Necessity of Traditional Art’. Subsequently this speech was introduced into the curriculum of an American university by Prof. the Rev. Dr. Douglas Kelly. After the third year of his studies at the Royal Academy, Charles then condensed his first three years of study into six classes which he then reduced to five. These classes then became the base line in art education for all standards and all ages thereafter. Whilst still a student at the Royal Academy Charles was headhunted by the former Chief Educationalist for Surrey Ian Smith to report on the standard of art education in schools in Surrey. This consisted of reporting on 90 schools, 3 colleges and a prominent university. During this period Charles created the first ‘Artist in Residence’ scheme in British schools which was featured on the BBC 6 O’clock News television programme. As a part of this innovative project, Charles also held mixed evening classes comprised of pupils, teachers and parents alike, from differing age groups, and all at the same time. 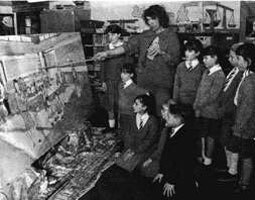 This project also included a major group painting of the schoolchildren, currently held in the collection of Surrey County Council. Thereafter Charles continued with his World Tour Exhibitions, including a charitable event in South Carolina with masterclasses, talks and a small exhibition in aid of a charitable Trust. The school was set up by U.S. Scottish ex-pats who funded this now exclusive school. Elsewhere many of his students have been accepted for colleges and universities throughout Britain and Overseas. His students have also won many prizes and awards. In recent times for example, a fourteen-year-old student won the top Scottish Schools Painting Prize. Charles then moved to Scotland to care for his elderly parents who were located in Scone, Perthshire. 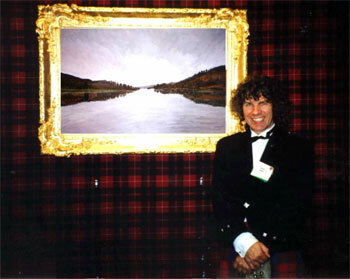 He also ran a large Art Centre in Scotland between 1995 and 2003. According to the Centre Manager Stephen Bainbridge, “The Centre organised over 500 separate art classes during this period. These were always concerned with the Language of Painting and held in an orderly and concise manner irrespective of any other considerations.” At the art centre in Scone, Charles and his team provided opportunities for young people who possessed talent and the desire to receive advanced art education. But because of circumstances or their family’s situation they might not have sufficient academic qualifications, nor could they qualify for an education loan, grant or scholarship. Many had talent, passion and have subsequently succeeded in their desire to achieve a high level through their dedication and hard work. Charles taught these young people who wished nothing other than to become artists, believing they should not be denied the opportunity because of their situation. Therefore without this access to proper art, and to levels of tuition those young students would otherwise not have been able to receive an opportunity to obtain a further education at a college or university, and to take this important route of self discovery and education. Yet today the idea persists that fine art is no longer ‘Art’ and the cult of ‘anything goes modernism’ believes it can exist without proper Drawing. It also encourages art students to conceptualise and academically study philosophy, which automatically discourages and restricts access to a subject that should educationally be generally available to all. In 2007-8 Charles staged masterclasses in six Art Schools in Abruzzo, a central region of Italy, prior to staging his largest-ever exhibition of 100 paintings, over 40 of which were 4ft x3ft or 6ft x 4ft. This major cultural Event lasted for an entire summer and opened a new art centre in Pescara. Charles also staged daily live demonstrations and gave evening talks in the centre’s lecture hall. For three consecutive years, Charles was invited to give talks at the Italian Shows at Earls Court and Olympia in London on Italian classical painting, upon which he is now considered an authority. These events had thousands of people through the doors and the talks Charles offered were greatly received. This three year period was then followed by the Abruzzo Master Class Programme and culminating in the major event of the huge Summer long Exhibition Event in Pescara. Charles also worked on a charity project in Italy and then staged masterclasses in three schools in Perthshire in Scotland. (Two of these schools were private and one a local state school.) And Kilgraston School for Girls in the Bridge of Earn, retained photographs of these classes on its website for a long time afterwards. -Father Jim McManus, Twice Leader of the Roman Catholic Church in Scotland. – Paolo D’Alleva, Major Italian Exhibition Co-ordinator. -Lynne Bulger, ‘Director of Medical Affairs’, GSK Pharmaceuticals, Ontario, Canada. – Alessandro Avataneo, Italian Film Director, Producer and Art Critic. -Olwen Morris, Royal Academy of Music, World famous Solo Concert Pianist and Chamber Music Composer. -Jorych Marsili, Artistic Director of Toni & Guy, International & UK Leader in Hairdressing and past Hairdresser of the Year UK. 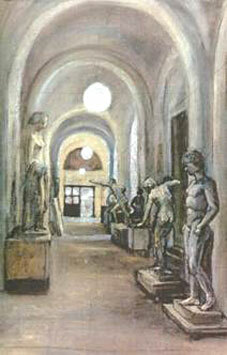 of learning in Fine Art.’ – Luciano D’Alfonso, Former Mayor of the City of Pescara, Italy. ‘With this book you show a down to earth intelligence, in touch with reality, that people don’t imitate, but wish they could.’ – Jill Davies, Dance Coach, Principal Ballet Dancer and retired Senior Civil Servant. – Mike Ash, Chairman of Grange Books, London.